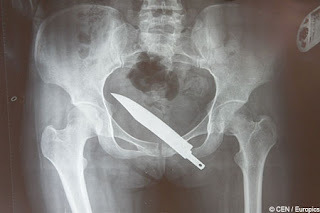 This is a weird news about a cheeky robbers that left a mugging victim with a mystery pain that doctors only got to the bottom of four months later – when they found a knife buried in her buttocks. Being robbed is a pain in the rear end at the best of times, but as you can see from this remarkable X-ray Ying Shi, 26, was left with a nasty reminder of the ordeal. Doctors found a razor-sharp six-inch blade buried so far into her bottom that it was pressing into her bladder. 'All I remember of the night was a stabbing pain in my backside. I thought they had just slashed me, I didn't realise the whole blade had gone all the way in,' she said. Doctors in Shanghai, eastern China, were stumped by Ying's stomach complaints, until they performed a scan. 'I am amazed they missed it the first time around but very relieved that they've found it now,' she said.